Scientists at the Georgia Cancer Center have developed a chimeric anticancer molecule that simultaneously targets three key human epidermal growth factor receptors (HER) that are overexpressed in drug-resistant HER2+ breast cancers. When tested in mice carrying human breast tumors, the three-in-one aptamer–siRNA, known as H2EH3, specifically bound to the tumor cells, and interfered with HER2 and HER3 signaling, triggering cancer cell apoptosis and inhibiting tumor growth, with no evidence of toxicity. “Owing to low immunogenicity, ease of production, and high thermostability, H2EH3 is a promising therapeutic to supplement current single HER inhibitors and may act as a treatment for HER2+ breast cancer with intrinsic or acquired resistance to current drugs,” the researchers state in their published paper in Molecular Therapy: Nucleic Acids. Approximately 20% to 30% of breast cancers are characterized by HER2 overexpression, which is associated with poor prognosis, high tumor aggressiveness, and extensive drug resistance, the authors explain. While the humanized antibody trastuzumab (Herceptin) is used as first-line treatment for patients with HER2+ breast cancer, the majority of patients will eventually develop resistance. This resistance to HER2-targeted therapies is linked with increased expression of other receptors in the HER family, including epidermal growth factor receptor (EGFR) and HER3. Studies in cell lines have also identified an HER2/HER3 heterodimer that seems to function like an oncogene that supports the proliferation of HER2-overexpressing tumor cells, the authors note. “The cross-talk and compensatory functionalities of HER family receptors provide strong rationales for co-targeting EGFR, HER2, and HER3 in HER-dependent cancer treatment,” they write. In vitro tests demonstrated that the H2EH3 chimera specifically inhibited the growth of HER2+HER3+ cell lines, but not HER2– and HER3– cell lines. Cell cycle analyses indicated that H2EH3 induced cell death in the HER2+HER3+ cell lines by triggering cell cycle arrest and apoptosis. Interestingly, the single-molecule H2EH3 construct was more effective against the HER2+HER3+ cell lines than a mixture of the three individual components—HER2 aptamer, HER3 aptamer, and EGFR siRNA. Subsequent in vitro assays indicated that the H2EH3 construct binds specifically to the HER2 and HER3 receptors. In vivo tests in mice bearing HER2+HER3+ breast tumors also demonstrated that administering H2EH3 intravenously or intratumorally led to significant reductions in tumor size—again, the chimera was more effective than the three individual constructs administered as a mixture. There was no evidence of nonspecific accumulation of H2EH3 in other major organs following tail-vein injection, except in the intestine and stomach (“those locations are the places for clearance of chimeras from bodies,” the authors state). Further immunohistochemical assays indicated that HE2EH3 administration reduced expression of EGFR, HER2, and HER3 and induced tumor cell-cycle arrest and apoptosis, “which is translated into significant suppression of tumor growth in mouse xenograft models.” Encouragingly, there was no evidence of any treatment-related toxicity, or that H2E3 triggered any unwanted immune responses. The authors suggest that the large size of the three-in-one chimera could mean that the drug would, in addition, have a longer circulating lifetime than would each aptamer alone. 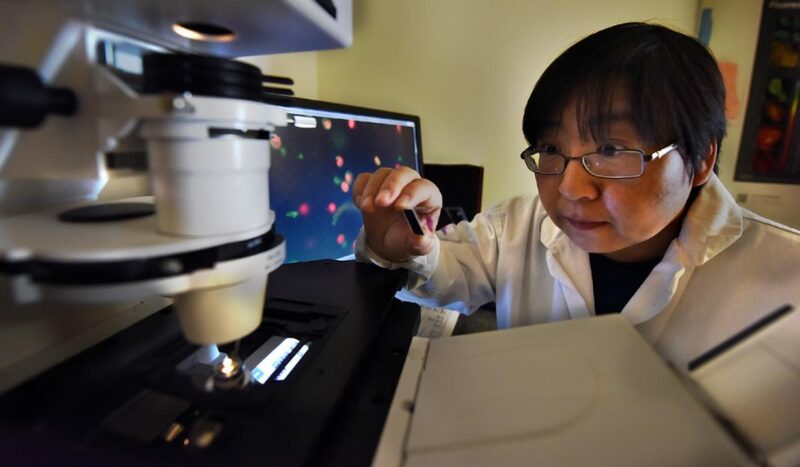 Dr. Liu’s team suggests that the new molecule may also be effective against other tumor types, such as lung and head and neck, which rely on the HER family of growth factors. The researchers are continuing to test the H2EH3 chimera in drug-resistant breast cancers, both through collaborations with clinicians and with researchers who have developed drug-resistant cell lines.